At least 20 people are feared dead after a fatal car crash at the Sachangwan area on the Nakuru-Eldoret highway, Kenya yesterday. The accident that occurred around 11 am, occurred after a truck carrying fertilizer towards Nakuru lost control and rammed into Modern Coast bus, causing an accident that involved 13 vehicles: Modern Coast bus, four Nissan Matatus, a land cruiser, a truck and several other private vehicles. There was a dispute over the number of the wounded, but National Transport and Safety Authority (NTSA) Director General, Francis Mejja, on Tuesday evening said that at least 16 people had been confirmed dead. 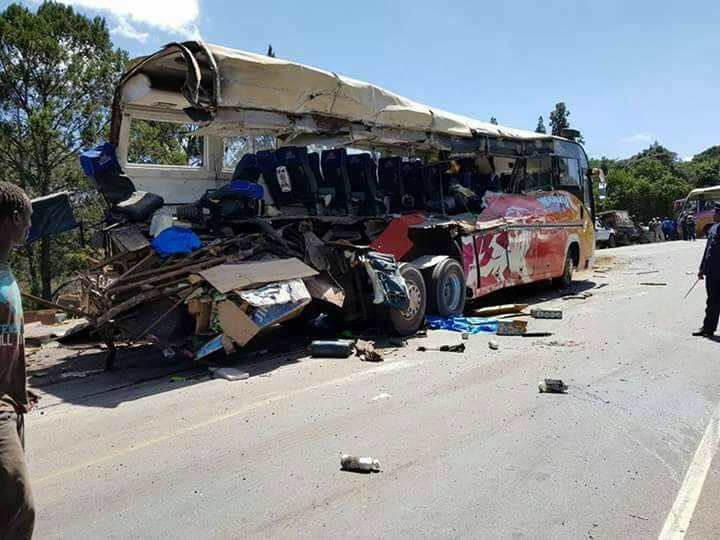 Nakuru County Police Commander Hassan Rashid Barua said that 14 people died in the accident; 13 of whom, he said, died immediately after the accident while one child died at the Nakuru Level Five Hospital. However, those who saw the accident insisted the number of deaths was over 20, with many passengers being caught up in the mangled wreckage of the vehicles. Mr. Barua said they are yet to establish the exact number of people who were wounded. He confirmed that casualties were rushed to Molo Level Four hospital while others were rushed to Nakuru Level Five hospital. The accident caused a heavy traffic jam on the busy highway as police and rescue teams struggled to clear the scene amid a surging crowd of shocked onlookers. While earlier reports indicated that the driver of the truck was evading NTSA officials when he lost control. Mr. Mejja denied the claims saying the driver might have been driving in free-gear.